The season that has been teasing us for so long is almost here! What better way to celebrate than with a Spring Cash giveaway! 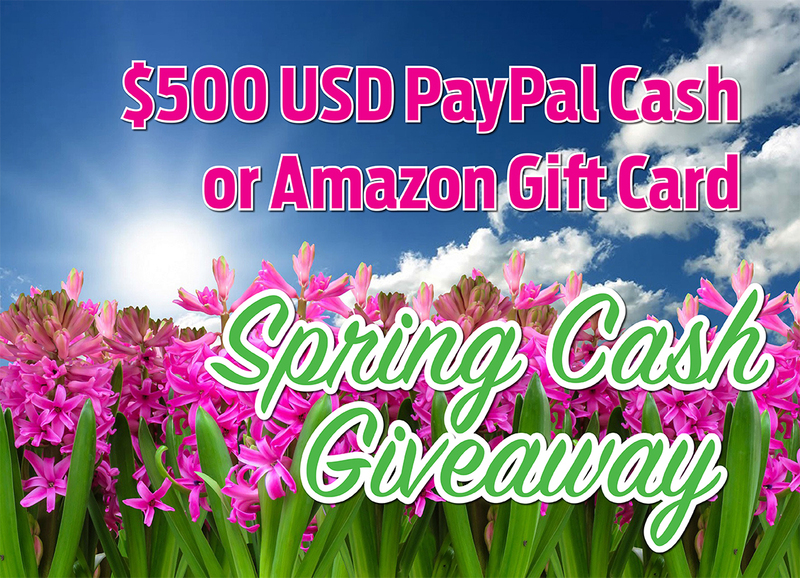 I have partnered with some fantastic bloggers to bring you a Spring Cash Giveaway worth $500 USD PayPal Cash, or a $500 USD Amazon Gift Card, for 4 lucky people! Show me the money! 3 Spring Cash prizes of $500 Cash! Who couldn’t use an extra $500 in their pockets? You could pay off some credit card debt, do a romantic weekend getaway, put it towards a family vacation, take your significant other out to a really nice dinner and still have money left over, donate to some of your favourite charities, or buy something nice for that special someone in your life. So much you can do with $500! Enter the Spring Cash Giveaway now! Click on the link below, enter in all of your info, and then gain lots of chances of winning by liking/following/subscribing to the participating bloggers’ social channels. The more you like/follow/subscribe, the more chances you have of winning the Spring Cash! The Spring Cash contest starts March 17th 2018 at 12:00am EST, and ends April 17th 2018 at 11:59pm EST. Disclaimer: This giveaway is not affiliated with PayPal, Amazon, or any social networks. Terms and conditions: No purchase necessary. Giveaway starts on 3/17/18 at 12:00AM EST. It ends on 4/17/18 @ 11:59PM EST. 4 (four) people will win $500 via Amazon GC or Paypal cash. To be eligible to win entrants must be 21 years or older. Entrants must complete entries and each winning entry will be verified. If selected winner does not complete or verify entry a new winner will be chosen. Winners will be notified no later than 4/18/18. Winner will be emailed and must respond to claim prize within 48 hours via the email they signed into the widget with. If winner doesn’t respond within 48 hours a new winner will be chosen. Once winners have claimed prizes they will be announced on the Winner’s Circle page and sent to co-hosts. Void where prohibited. I am so excited that spring is nearly here!! This last part of winter had been the worst and felt the longest. Bring on the warm weather! This is crazy amazing…. How happy am I that I subscribe by email. This prize would certainly come in handy…for paying bills, or buying groceries, or just treating myself. Or all three! Its nice and sunny today but still cool. At least there’s no snow! WOW!!!! !$2000 Spring Cash Giveaway is an awesome prize, Thanks to everyone who sponsored this amazing prize. This is a great prize. Thank You for hosting it. Thanks so much. This would be a blessing right now. This would really come in useful. We have a number of places it could do some good. That would come in handy! Thank you! I am so excited for spring and this giveaway adds to my excitment! What a perfect way to kick off the spring season!! The ultimate giveaway, thanks!! This is a great prize. ThankS for hosting it. Thank you for a chance to win a bit of extra cash or a gift card. Nice to help out with something new for Spring. Thank you for this giveaway and the chance to win a great deal of $! Love the pics on your blog. Keep ’em coming! Thank you for the chance! I can’t wait for Spring weather to arrive! Thank you for the giveaway. Its such a nice sunny day and my tulips are starting to ‘spring’ up! oh wow awesome!! Somebody is going to be happy!! I’ve been looking forward to spring for some time now (like, the whole winter) but it doesn’t seem to be coming any time soon! Another nice but cool sunny day here, but I heard our friends out east got a ton of snow yesterday. Ouch! Now we have 2 reasons to be excited that Spring has arrived, thx very much to the sponsors for this ahhhhhh-some giveaway!!! Spring is my favourite season and I love to celebrate with my husband and friends. Finally, a warm day today – and sunny! Hey … popping in for my comment entry. It is so warm outside. Things are melting. Soon the inbetween will be over and summer will be among us. Finally a little rain today! Hopefully some flowers will pop up soon. There’s nothing better than spring flowers… except maybe some spring cash! This is a really generous giveaway! Thanks for the chance!! One more day of work —- and then holidays for the next two days. At home but will be nice to have the 2 days off. This is fantastic! What a great way to celebrate spring. Going to church and eating chocolate bunnies!! $500 is a good donation and buys lots of chocolate bunnies. Another day, another try to win! Thanks for the opportunity! Hoping April is off to a warmer start for you all! What a great Easter weekend.. Hope you all enjoyed yourselves. Hard to believe its spring today – its freezing outside!! Another hard-to-believe-its-spring day. So cool and crazy windy. Getting slightly closer to spring weather here, thankful for a warmer day. Good luck all! What an awesome contest, fingers are crossed here. I found this post on bigdaddykreativ. I can’t believe it snowed today! Just a little and nothing stuck to the ground but still… snow! Thank you for the chance to win some good cash! So excited for sunny days! thanks for this amazing giveaway. Wow awesome giveaway. Fingers crossed. Finally expecting those April Showers in the next few days… Can’t wait for the flowers! Wishing the snow would melt, thanks for the chance. April showers bring May flowers! Good luck all. Looking forward to sunnier days. Happy April! Thanks for the chance. Every season I clean big… today === under the beds and in the closets… And —- I love it. Spring cleaning… Dentist-style! What a great feeling after having a professional cleaning, and NO cavities! So many chances to win… thanks! Preparing for some nasty weather this weekend. Hope for the best. Another day closer to May flowers! I was referred by a very good friend (which is how I found your giveaway). Thanks for the chance! This was a beautiful morning to spend time with my son and go for a drive, do some shopping and just talk. Only a couple of days left in this awesome contest! Good luck everyone. Money for the spring..how can it grt better? So excited to find out who the lucky winners are, thanks for the chance! Wow last day! good luck!